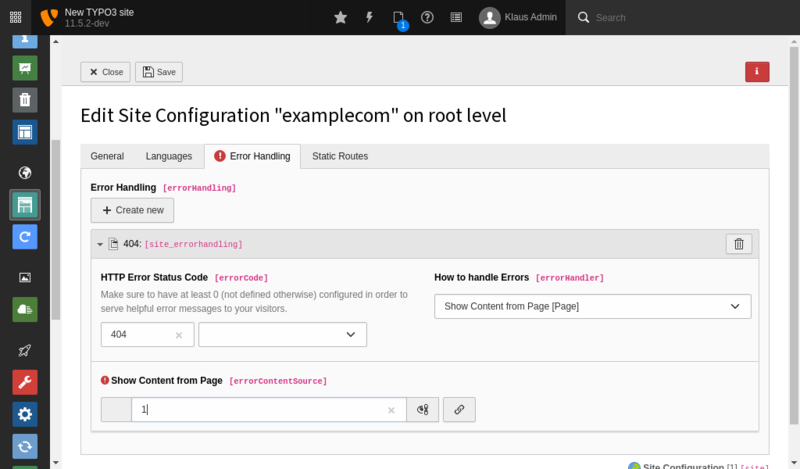 Error handling can be configured on site level and is automatically dependent on the current site and language. You can define one error handler per HTTP error code and add a generic one that serves all error pages. No more trouble with translated 404 error pages. With the new site handling getting translated 404 is easy! The HTTP (Error) Status Code to handle. The predefined list contains the most common errors, a free definition of other error codes is also possible. Special value 0 will take care of all errors. Define how to handle these errors. May be Fluid for rendering a fluid template, page for fetching content from a page or PHP for a custom implementation. Only if errorHandler == `fluid`: Pathes to Fluid Templates, Partials and Layouts in case more flexibility is needed. May be either an External URL or TYPO3 Page that will be fetched with curl and displayed in case of an error. Fully qualified class name of a custom error handler implementing PageErrorHandlerInterface.